I thought this was meant to be a bird box but the wasps thought differently. Wasps are a large and diverse group of insects with tens of thousands of species including Hornets, Yellow Jackets and solitary wasps. Some social wasps live together in a nest with an egg-laying queen but the greater numbers are solitary species. Wasps like munching on ripen fruit Plums, Pears and Apples. They are not the main villain as they only attack fruit that is already damaged by birds or other insects. Their mouths are not usually strong enough to break the skin. Grapes can be susceptible to damage but bunches of fruit can be wrapped in muslin or old nylons. The sting of a wasp is how they catch some of there food prey. In late summer humans may get stung as wasps start to mate for the following year. Wasps may sting more than once if people come close to them but the pain is less than that of most bees. 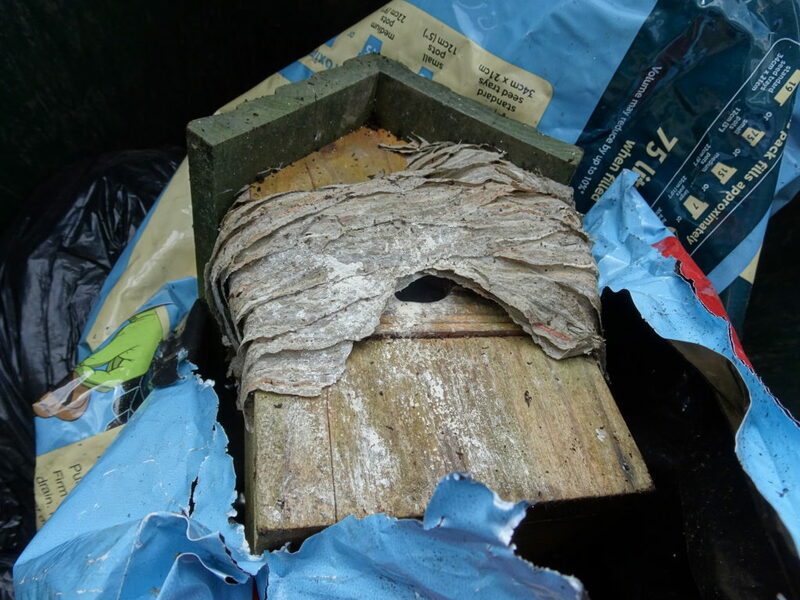 Wasp nests made from chewed wood pulp and saliva can be found in roof spaces, under eaves or in bird boxes but are not generally a serious problem. Wasps are predators and parasites so can help in a garden as the larvae feed on aphids and caterpillars. Wasps are major pollinators in the UK and around the world. Cynipids can form a variety of gall on Oak tree leaves, stems and roots. Some years the galls can be very numerous but no serious harm will be done and no control is required. The underside of leaves may get rust brown spangle galls or brown spot gall. 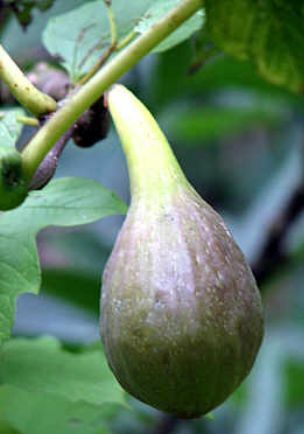 The Brown Turkey fig, Ficus carica, produces large, sweet, juicy figs even in British conditions. Grown in a large pot they can get upto 12 feet tall but to encourage fruit prune in autumn and keep to a reasonable size about 5 -6 feet tall. Keep plants well watered particularly when young. Grown against a south facing wall the full sun will encourage both fruiting and ripening. Expect fruit to ripen in August or September and pick regularly leaving tiny, embryo fruit towards the ends of the shoots will over-winter and will ripen the following year. Left to grow some Figs varieties can produce very large trees but they are not suitable for the British climate. Fig trees do not need a pollinator so one tree should suffice. Some winter protection may be needed in very hard frost. Constrain the roots to encourage fruit and suppress the desire for the fig to become a large tree. 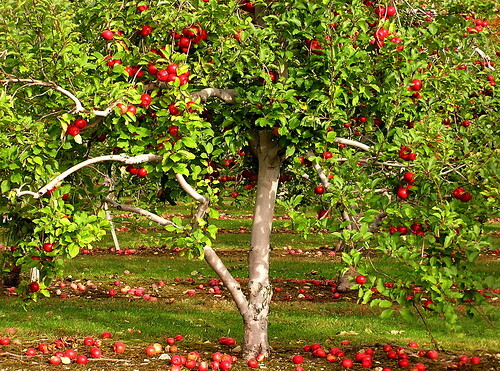 So you want to grow Apples, Plums, Pears and some orchard type fruit trees. Well stone me these are right pips fresh from our garden tips. Novice gardeners can expect to get fair crops from Fruit trees and bushes without too much effort. With extra care a great deal more can be achieved. Go for well know fruit types do not start off with the exotic. Buy good quality plants from a local nursery. Ask nurserymen what varieties grow well locally and do they need other trees as pollinators. Give them enough space to grow in fair soil with some sunshine. Do not just cram them into a small corner space. Trees need time to establish themselves but get better with time so do not rush the crops. Bushes and canes will produce a crop quicker.